By supporting Christ-centered education, we are raising up an empowered, God-honoring generation, equipping them to escape the cycle of poverty that has plagued their families for generations. These educated children and young adults can provide for themselves with dignity. The process begins with reading, writing and arithmetic — basic academic skills. Many poor children would never obtain an education without outside help, so we remain committed to promoting and funding Christian education on their behalf. The support from our donors in 2018 funded scholarships, salaries and other critical components of our partners’ educational outreaches. One of those outreaches, Elohim Evangelical School in Peru, provides poor children with Christian education and daily meals. We also funded the construction of a new school building at the Boukan Kare campus of Divine Shelter Schools. Haiti is the poorest country in the Western Hemisphere, but we’ve given the next generation hope for a better future. Thousands of Haitian children receive a Christian education and nutritious daily lunches at 17 Divine Shelter School campuses each day. One of the most remote campuses, DSS Boukan Kare was in desperate need of a new school building. Children were crammed into classrooms and the building was crumbling. 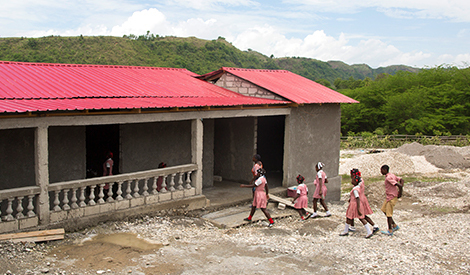 With help from our generous supporters, Cross International funded the construction of a new schoolhouse that will serve poor children for generations to come! Cross International funded a new schoolhouse, complete with 9 classrooms, a cafeteria, kitchen, administrative offices and storage space. 396 students and 12 staff members are benefiting from the new building. Along with the new schoolhouse, Cross International funded a freestanding restroom and washbasin. Each day, children learn the truth of the Bible and Jesus’ love for them!